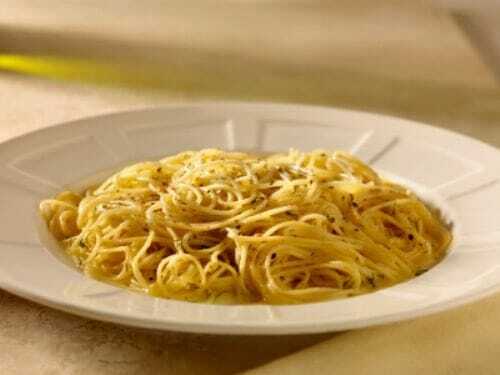 Home » Copycat Restaurant Recipes » Black Kettle`s Pasta with Garlic Butter Recipe – make a simple pasta dinner with just a few ingredients that tastes like you put a lot of work into your dinner. Black Kettle`s Pasta with Garlic Butter Recipe – make a simple pasta dinner with just a few ingredients that tastes like you put a lot of work into your dinner. Are you ever looking for a dinner that tastes like you put a lot of time into this, but you can literally throw this together so quickly. I bet you can make this meal in less than 30 minutes. We recommend serving this with a salad to make a complete meal. Make a simple pasta dinner with just a few ingredients that taste like you put a lot of work into your dinner. Melt butter in medium saucepan. Add all remaining ingredients except cheese and pasta and heat through. Ladle over warm fresh pasta. Garnish with cheese.